It is turning cold here. The grass has stopped growing, the sun rises and sets all too quickly, and the winds are starting to howl around the house. We still are able to eat our own food. There was a mess of a hoophouse here when we bought the property..a guy stopped by a couple of times when we first moved here offering to purchase. Homer cleared out lots of overgrowth (trees and all!) and garbage and we purchased a new cover for the frame. 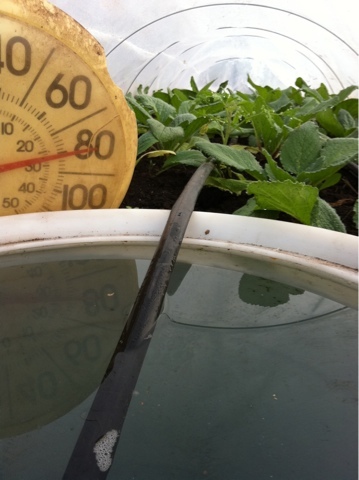 And just a layer of plastic produces amazing growing conditions..no additional heat but the sun. Homer has tomato plants under another layer of plastic with full 55 gallon barrels of water tucked under there too, and the tomato plants are growing beautifully. Green, thick, happy looking. Lowest temperature outside has been in the 20's and the plants keep growing. He will have to play pollinator when they bloom, as no bugs are out. Even on cloudy days the temperature under there goes to 70 or more. On sunny days it is a tropical paradise, with sun heating the space to 100 degrees. Outside there are many things growing with fabric covers over them. And a few growing with no protection at all. 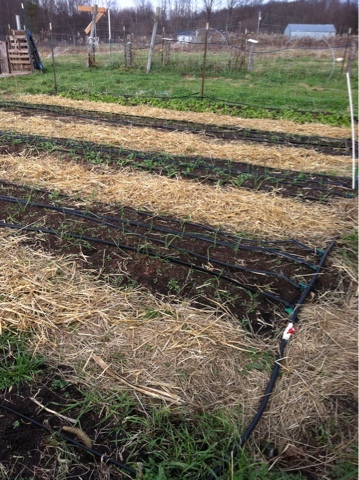 Garlic is planted in the fall, grows all winter and spring, dries summer and fall, gets pulled and used daily by us! The laying hens are out too. Between the rows, digging and cleaning up. 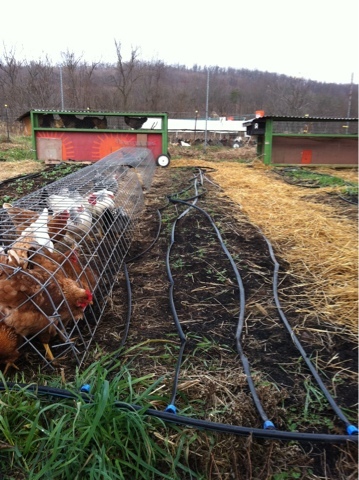 Soon hoses will freeze solid and we will carry water to the hens in 5 gallon buckets, poured into their wire enforced rubber water trays. Every day we will pop out the frozen water and refill the trays, the girls have fresh water available until it freezes again. During the brutally cold time of January and February this needs to be done twice a day, as even during sunny days water freezes. We don't look forward to those days.